Hearing loss as one of the most common disabilities approximately over 5% of the world's population – 360 million people – has disabling hearing loss (328 million adults and 32 million children). Recent developments in stem cell technology provide new opportunities for the treatment of deafness. miRNAs are essential factors of an extensively conserved posttranscriptional process controlling gene expression at mRNA level. 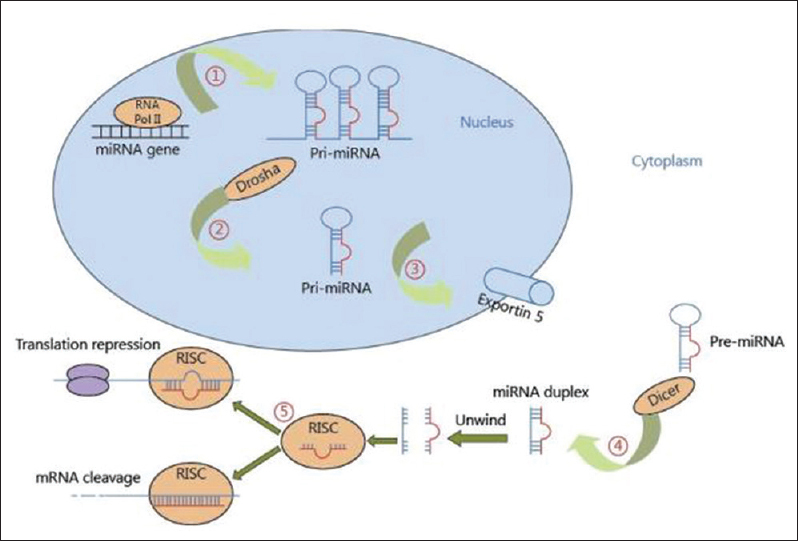 Various biological processes such as growth and differentiation are regulated by miRNAs. In this review paper we have discussed about the application of miR-183 family and mesenchymal stem cells as a possibility for restoring hearing loss. In this regards, the web of Science and PubMed databases were searched using the Endnote software for the publications about the application of miR-183 family and mesenchymal stem cells (MSCs) to study hearing loss published from 2000 to 2016. The miR-183 family (miR-183, miR-96, and miR-182) is expressed abundantly in sensory cells in inner ear. miR-183 family is significant for the development and persistence of auditory neurons and hair cell. These four genes, i.e. Sox2, Notch1, Jag1, and Hes1, are potentially the targets of miR-183 family. In studies on animal models such as mouse and zebrafish, the time of Atoh1 expression in the hair cells was found to be the E12/5-E14/5 day, and miR-183 family was reported to begin to express on the E14/5 day. Use of human MSCs in differentiating into hair cells has been investigated, demonstrating that MSCs have neuroregenerative capacity. Cell therapy-targeting regeneration of the auditory neurons and hair cell may therefore be a powerful strategy to cure hearing loss that cannot be reversed by current therapies. A combination of the MSCs, specific growth factors and miR-183 cluster (96-182-183) can increase the potential to differentiate into the auditory neurons and hair cell. 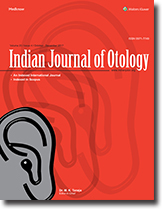 Background: Chronic suppurative otitis media (CSOM) is a rampant clinical entity in India, and hearing loss is a very debilitating condition which is treatable. Hence, ossiculoplasty is a frequently combined operation with myringoplasty to reconstruct the hearing apparatus of a CSOM patient. 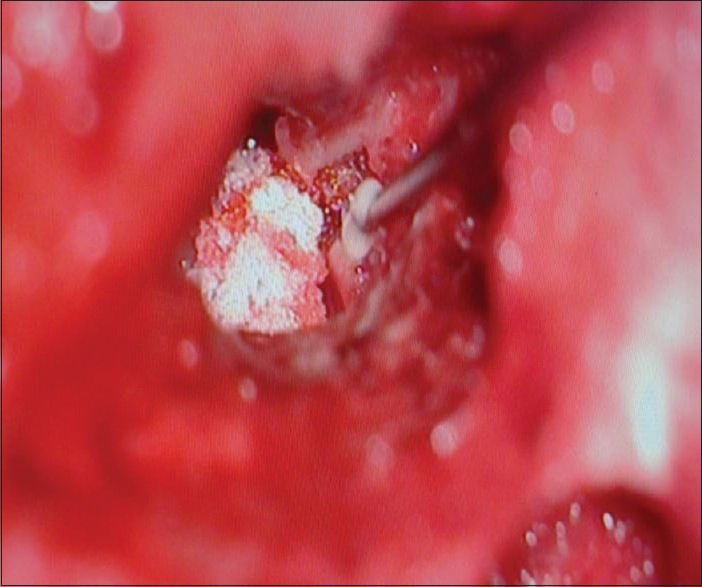 Ossiculoplasty can be accomplished through autograft, homograft, and allograft materials. The glass ionomer cement (GIC) included under bone cement is biocompatible and easily available, for restoring the ossicular continuity, more specifically, the incudostapedial joint. Objective: The purpose of this study is to evaluate hearing improvement after repair of ossicular discontinuity between the incus and stapes with GIC. Materials and Methods: This prospective clinical study was conducted in a tertiary care hospital. CSOM patients found to have incudostapedial joint discontinuity intraoperative underwent ossiculoplasty with GIC. Postoperatively, hearing was evaluated at 1 month and 3 months. 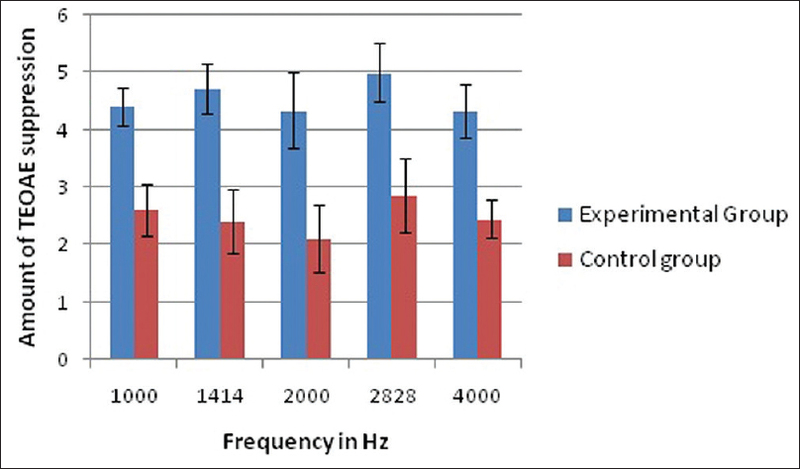 Audiometric pure-tone threshold by air conduction (AC) was recorded at 0.5, 1, 2, 3, 4, 6, and 8 kHz and by bone conduction at 0.5, 1, 2, 3, and 4 kHz. As per the AAO-CHE guidelines, thresholds at 0.5, 1, 2, and 3 kHz were used to calculate the Pure Tone Average (PTA). The air-bone gap (ABG) was calculated for each patient and the results were tabulated. Results: At the end of each predesignated PTA evaluation, postoperatively, the patients showed improvement in AC thresholds and narrowing of ABG, which was statistically significant. In our study, after applying GIC, the mean AC was 30.89 dB at the end of 3rd month which was significant improvement. Eighteen patients (66.67%) had closure of ABG <20 dB. Interpretation and Conclusion: The current study reveals that tympano-ossicular reconstruction using GIC is a simple, cost-effective method which gives definite good postoperative hearing improvement. Other advantages are more physiological continuity between the incus and stapes, technically easier application, nonextrusion. Aim: The aim of this article is to study the effect of hyperuricemia on auditory functions. Materials and Methods: This was an academic institution (Indira Gandhi Medical College, Shimla, HP, India)-based, prospective, observational case–control study with 25 hyperuricemic individuals. Individuals with any confounding factor were excluded from the study. 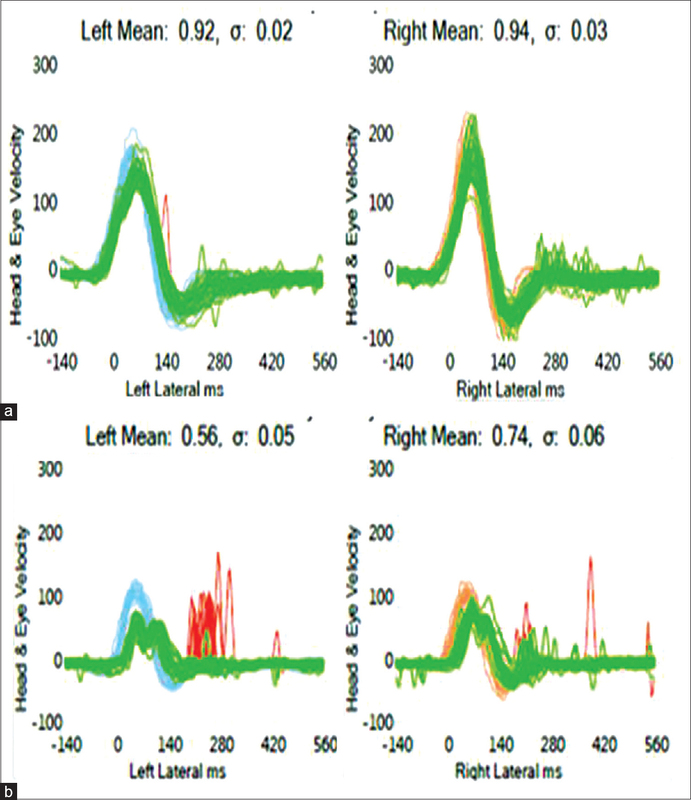 Cochlear functions were evaluated using pure tone audiometry, transient evoked otoacoustic emission (TEOAE), and distortion product otoacoustic emission (DPOAE). Results: This study found reduced responses at higher frequencies on DPOAE and TEOAE in the case group. On TEOAE, statistically significant difference was observed in the signal-noise ratio at 4 and 3 KHz with P < 0.001. Signal-noise ratio of DPOAE was also found statistically significant at 5 and 6 KHz. Conclusions: This study found association of asymptomatic hyperuricemia and hearing loss, especially at high frequencies. In our opinion, hyperuricemia causes cochlear damage through crystal formation and minor vessel atherosclerosis. Introduction: The present study attempted to determine the effect of practicing Yoga on the functioning of the efferent auditory system using contralateral suppression of otoacoustic emissions (OAE). Method: The efferent suppression of transient evoked OAE (TEOAE), and distortion product OAE (DPOAE) was recorded from 40 participants (20 who practice Yoga regularly and 20 who do not practice yoga regularly). Results: The results of this study showed that there was an increase in the amount of suppression of both TEOAE and DPOAE in individuals who practice Yoga. The result suggests that Yoga enhances the sensory perception and improves auditory attention. The constant practice of Yoga could have led to the plasticity of the efferent auditory system. Conclusions: Thus, the practice of Yoga may be used to strengthen the efferent auditory system. However, further studies on a larger group of the population are essential for better clinical applicability of the results. Objective: The objective of this study is to study the role of antiviral medication on treatment of recurrent vertigo due to various vestibulopathies. Materials and Methods: Sixty-six adult patients of vestibular neuronitis (VN), Meniere's disease (MD), and benign paroxysmal positional vertigo were enrolled in this study, patients in each disorder where distributed randomly in two groups, Group A (antiviral) and Group B (nonantiviral). All Patients were assessed on the basis of reduction in dose of vestibular sedative drugs needed for control of vertigo on 1st, 3rd, and 5th day of treatment. Results: Statistically significant reduction in dose of labyrinthine sedatives was found to control vertigo in Group A patients as compared to Group B patients in both VN and MD. This reduction in dose of labyrinthine sedatives was seen on day 3 as well as on day 5 of treatment. Conclusion: This study shows that use of antiviral drugs significantly reduces the dose of vestibular sedatives needed for control of vertigo in MD and VN and hence should be used on a regular basis to treat these ailments. Introduction: Cisplatin is a well-known chemotherapeutic agent used in many cancer treatments. Several antioxidant agents are used for diminishing the toxic side effects of the cisplatin therapy. Alpha-lipoic acid (α-LA) and oxytocin (OT) are antioxidant agents that can be used in toxicity. Our aim is to investigate the effect of these antioxidants in cisplatin-induced ototoxicity in tissue level. Materials and Methods: Forty Wistar albino rats divided into five groups as control, cisplatin, cisplatin + intraperitoneal (IP) OT, cisplatin + intratympanic (IT) OT, and cisplatin + IT α-LA. The drug administration is applied for 4 days, and at the end of the procedure, the cochleas are harvested. After tissue preparation, GSTP1 levels are investigated and the intensity of the reaction is scored as negative (−), weak (1+), moderate (2+), or strong (3+). Results: Group 4 has a moderate staining which can be interpreted as high immunoreaction. When we compare with Group 1, this staining difference is statistically significant (P < 0.02). When we observe the Group 3, we cannot detect any difference with Group 1 in immunoreactivity. Conclusion: α-LA and OT are antioxidants effective against cisplatin ototoxicity. The expression of GSTP1 isozyme is increased in antioxidant-treated groups. Increased levels of these isozymes proved the increased healing response in tissue levels. Antioxidant agents can be used for adverse effects during cisplatin treatment. IT route is effective as IP systemic route. Background: Most of the cases of pediatric hearing loss are avoidable through primary prevention. This study aims to identify the common risk factors/identifiable causes and type of hearing loss among the pediatric age group in the study location. Methods: A retrospective study of pediatric patients diagnosed with hearing loss. The clinical records of these patients seen at the study center from 2009 to 2012 were reviewed. Demography, histories of risk factors, and type of hearing loss were obtained from the record. The data collected were analyzed using IBM SPSS version 16. Results: Three hundred and twenty-one (10.33%) children were diagnosed with hearing loss with a male-to-female ratio 1.8:1. Average age at diagnosis was 2.65 and 3.35 years for bilateral and unilateral hearing losses, respectively, bilateral hearing loss, 304 (94.70%), and unilateral hearing loss, 17 (5.29%). Furthermore, 235 (73.20%) children had predisposing risk factors while 86 (26.79%) had no identifiable risk factor. The most common risk factor was febrile illness and its treatment in 163 (50.7%), followed by middle ear infections in 29 (9.03%). A family history of hearing loss, prematurity, or complicated perinatal course was found in 17 (5.29%) patients. Seven (2.18%) cases had sickle cell disease. Sensorineural hearing loss was observed in 228 (71.0%) on the right ear and 222 (69.2%) on the left ear while conductive hearing loss accounted for 21 (6.54%) and 25 (7.78%), respectively, while mixed hearing loss was 9 (3.1%). Conclusion: Hearing loss constitutes about 10.33% of all pediatric ear, nose, and throat diseases within the period under review. There were more males than females. Febrile illnesses and their treatment are the most common risk factors. The most common cause of these fevers was meningitis, measles, malaria, mumps, and sepsis. Sensorineural hearing loss is also the most common type of hearing loss. Introduction: Speech language outcomes are often variable in hearing impaired children managed with cochlear Implantation. Co-existing Attention Deficit Hyperactive Disorder may be responsible in some cases. Active management of these cases may result in improved outcomes in terms of better speech language acquisition. This study compared the progress in speech language acquisition in paediatric cochlear implant recipients with coexisting ADHD before and after intervention with Behaviour Modification Therapy (BMT) and /or pharmacological treatment. Materials and Methods: The study group was of 20 hearing impaired children post cochlear implant with co-existing ADHD who did not show expected results with regular AVT for 3 months post implant. Management of ADHD was instituted as per laid down protocol and CAP scores were compared at 0, 3, 6, 9 and 12 months post implantation. The scores obtained were subjected to a Wilcoxon sign rank test and P value derived. Results: The CAP scores after the inclusion of treatment for ADHD showed a definite improvement with a highly significant P value. Conclusions: Variables such as co-existent ADHD must be actively looked for in hearing impaired children prior to surgery and. Appropriate treatment in the form of BMT and / or medication should be instituted to improve the performance. Aim: Video head impulse test is a clinical tool found useful for assessment of each of the 6 semicircular canals independent of each other. However there is little known about relative efficacy of the two measures, vestibulo-ocular reflex gain and refixation saccade, in identifying the presence of a vestibular pathology. The present study therefore aimed at investigating the utility of each of these measures in identifying vestibular pathology. Materials and Methods: Twenty subjects with normal audio-vestibular system and 20 subjects with vestibulopathies underwent video head impulse testing. Results: The VOR gain was significantly higher in lateral and posterior canals and presence of refixation saccades was in significantly higher proportion of individuals with vestibulopathies than the controls (p < 0.05). When presence of either refixation saccades or reduced VOR gain was considered an abnormal result, the sensitivity was ~71% and ~43% and specificity was ~92% and ~82% for lateral and posterior canals respectively. When presence of either refixation saccades or reduced VOR gain for either of the two canals was considered an abnormal result, the sensitivity shot up to reach ~86% whereas the specificity plummeted slightly to drop to75%. Conclusion: The video head impulse test can differentiate vestibulopathies from normal individuals and hence a clinically useful tool. Background: The diagnosis of Chronic Suppurative otitis media (CSOM) implies a permanent abnormality of the pars tensa or flaccida, most likely a result of earlier acute otitis media or negative middle ear pressure. Changes in the microbiological flora following the advent of sophisticated synthetic antibiotics increase the relevance of antibiotic sensitivity to plan a general outline of treatment for a patient with a chronically discharging ear. Aim: To evaluate the bacteriological causes of CSOM. To know their antibiotic sensitivity pattern to commonly used antibiotics. Study Design: Prospective Observational Study. Materials and Methods: Sixty patients of Suppurative otitis media both unilateral and bilateral who present with active purulent discharge for to Ear, Nose and Throat (ENT) Department will be prospectively studied. Patients were of all age group, both sexes and had symptoms of active ear discharge for more than 6 weeks. Patients suffering from SOM who are on systemic antibiotics and on topical medications to the ear were not included in the study. Results: Of the 60 patients 64% were males with maximum incidence in 26-50 y age group.55% of patients were from lower Socio Economic Status.Of the organisms isolated Staph. 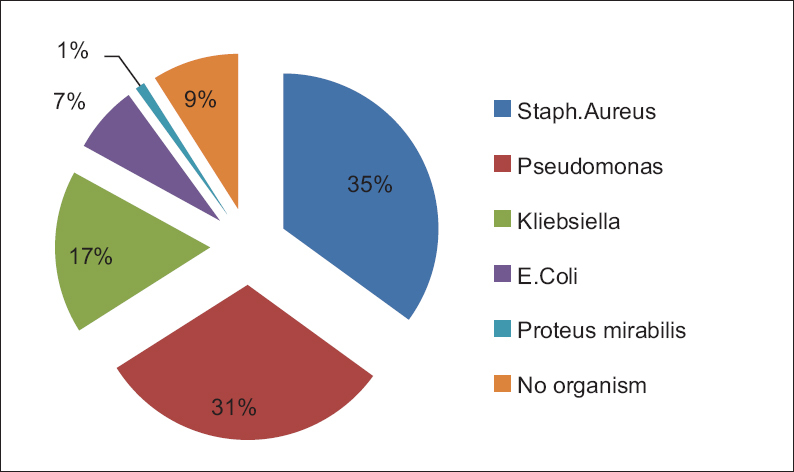 Aureus(35%) was most predominant followed by Pseudomonas(31%).All gram positive organisms were susceptible to Co-trimoxazole, Vancomycin , Gentamycin and all Gram negative to Meropenam, Aztreonam, Piperacillin. Conclusion: The patients should also be advised to take the drugs for the complete prescribed duration. This will not only help in minimizing the complications, but also help in preventing the emergence of resistant strains. Objective: The aim of the present study was to investigate whether several blood tests could be used as inflammatory indicators in active or inactive chronic suppurative otitis media patients. Methods: Between 2007 to 2014, this study was conducted in 358 consecutive patients having chronic suppurative otitis media were included in the present retrospective clinical study. Patients were divided into two groups based on the clinical history, otologic examination, audiological evaluation and intraoperative finding. Group 1 consisted of 163 patients who had inactive chronic suppurative otitis media, while group 2 was comprised of 195 patients who had active chronic suppurative otitis media and cholesteatomatous otitis media. Results: With respect to the neutrophil-lymphocyte ratio (P = 0 .001), the platelet-lymphocyte ratio (P = 0 .001), absolute lymphocytes (P = 0.001), absolute neutrophil (P = 0.001), platelet (P = 0,001) and white blood cell (P = 0,02), Group 1 and Group 2 showed statistically significant differences. Conclusion: The results we obtained showed that markers such as neutrophil-lymphocyte ratio, the platelet-lymphocyte ratio, platelet, absolute neutrophil and white blood cell could be used as guide in evaluation of the prognosis of chronic suppurative otitis media. Context and Aims: Tuberculosis (TB) has affected mankind since time immemorial. Extrapulmonary TB poses special diagnostic and therapeutic challenges. Temporal bone is an extremely rare target organ for tuberculous infection. It constitutes just 0.05%–0.9% of all chronic middle ear otitis cases. However, because of its rarity, it is often missed as a diagnosis, and thus there is a significant delay in initiating the treatment. The aim of this study was to identify the cases of tuberculous otomastoiditis (TOM) in patients undergoing middle ear surgery in a tertiary care hospital. Settings and Design: This was a retrospective chart review carried out in a tertiary care hospital. Materials and Methods: Nine hundred and fifty charts of patients undergoing middle ear surgery were studied. Three cases of TOM were identified. Results: All the patients had painless otorrhea and hearing loss as the presenting feature. Only one patient had facial nerve palsy. During the initial phase of management, TB was not suspected in any of the patients. Histopathological examination (HPE) of the tissue obtained at surgery provided the diagnosis in all the cases. The response to antitubercular treatment (ATT) was satisfactory in all three cases. Conclusions: TB should always be kept as a differential diagnosis in case of chronic middle ear infection, especially if there is a poor response to antibacterial treatment. HPE of the tissue and specific microbiological testing are the gold standard for diagnosis. The primary treatment in these cases is ATT with a limited role of surgery. Incidence of tuning fork-related complication is extremely rare. 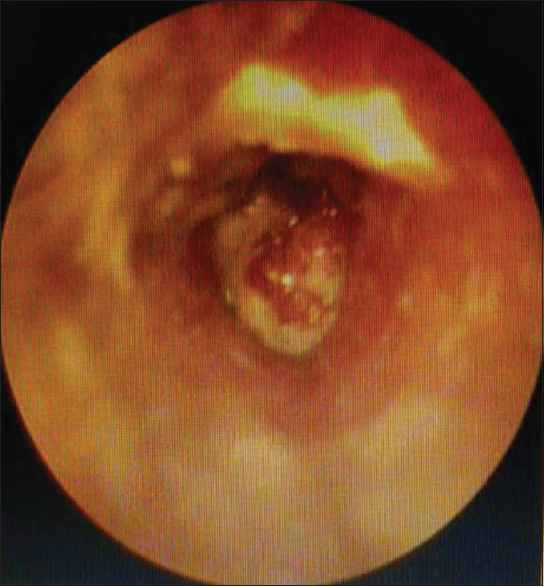 Here, we report a case of an 18-year-old gentleman who presented with a recurrent left ear discharge with a central perforation for the past 7-year duration. Left myringoplasty was performed after the ear condition was permissible. One week after surgery, he presented with an erythematous lesion over his forehead secondary to a tuning fork test which was done prior discharge. Facial nerve schwannomas are rare, benign slow-growing tumors arising from the Schwann cell sheath of the facial nerve. 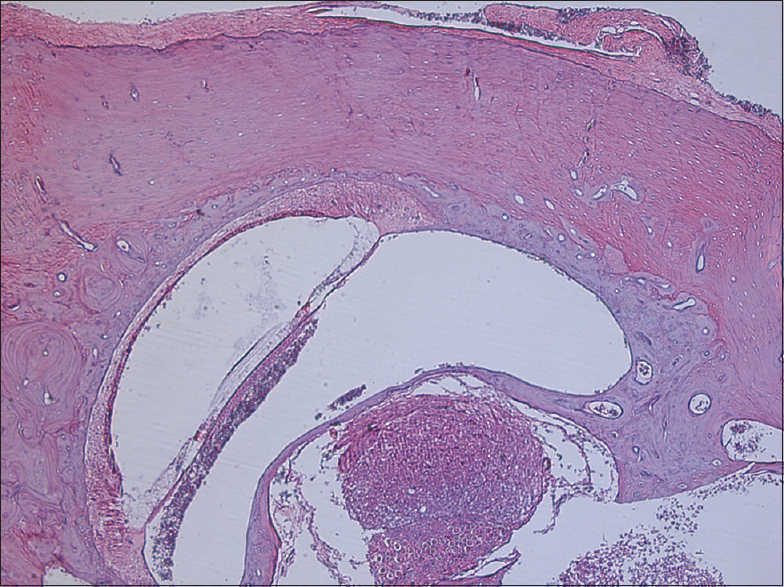 A 60-year-old female presented with a mass in the left parotid region for 6 months. It was associated with Grade 6 left lower motor neuron facial palsy. Malignancy of the parotid gland associated with facial nerve involvement was suspected. However, high-resolution computed tomography temporal bone and magnetic resonance imaging done showed a soft-tissue density along the vertical portion of the facial nerve and into the parotid gland. The lesion was eroding the skull base and was found to be in direct contact with the jugular bulb. She underwent excision of the tumor by a modified Blair incision along with a cortical mastoidectomy. Tumor abutting the jugular bulb was removed through transmastoid approach. Facial nerve was transected during tumor excision. Postoperatively, gold implant was inserted. Facial schwannomas can arise from any segment of the nerve, from the cerebellopontine angle to the extratemporal peripheral portion. About 650 cases have been reported in the world literature. The best timing for surgery depends on facial and hearing function, size, and intracranial mass effect. Nevus is a benign melanocytic tumor which occurs anywhere in the skin and is considered to be the most common type of skin tumor. Albeit rare, its manifestation over the external auditory canal has been reported. 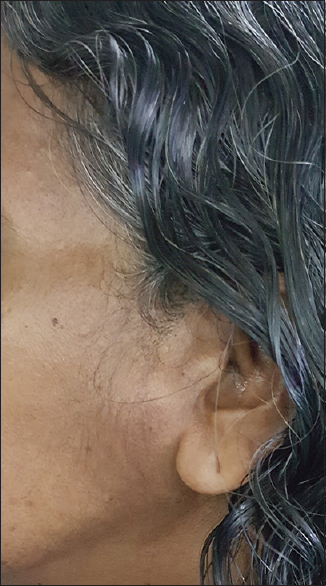 Herein, we present a case of a previously healthy middle-aged female who presented with insidious onset of left-sided aural fullness and tinnitus. Otoscopic finding revealed a peculiar-looking blackish polypoidal mass occupying left ear canal. Histopathological examination of the excised polypoidal mass turned out to be intradermal melanocytic nevi. 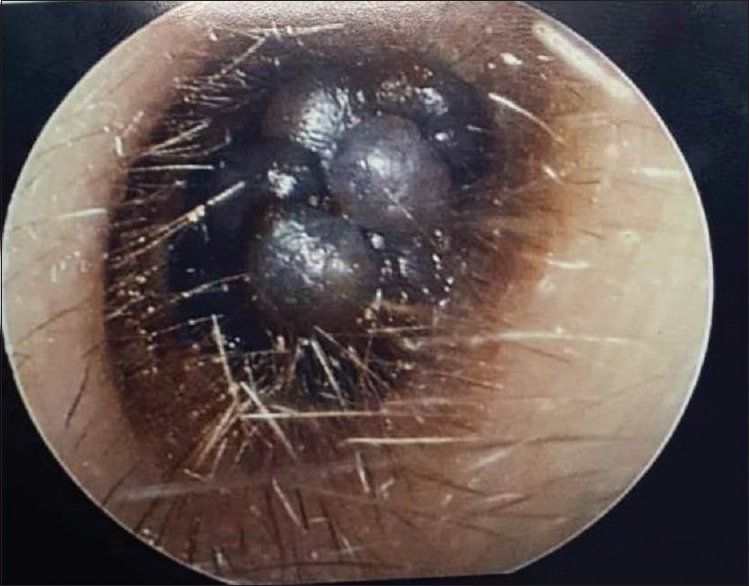 Melanocytic nevi in the ear canal may presents as polypoidal mass in a long-standing case. Any suspicious mass over the external auditory canal warrants excision along with histopathological examination of the excised mass as to exclude the possibility of malignancy.